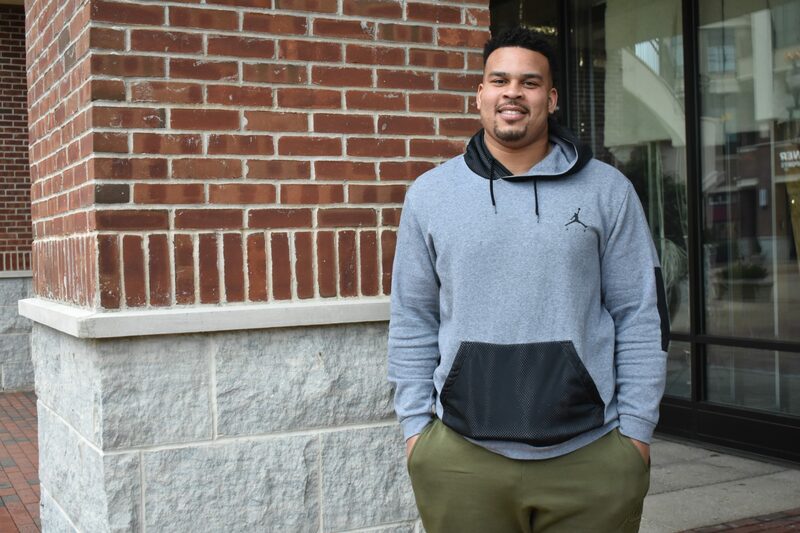 Philadelphia Eagles’ right guard and Medford resident Brandon Brooks is working hard to make his comeback. Philadelphia Eagles right guard Brandon Brooks is on the mend. Brooks injured his Achilles in January and is currently working hard in rehab to make his comeback. Brandon Brooks wasn’t naive enough to think he’d go his whole career without an injury. “I’m a firm believer in the fact that you’ve only got so many hits before you get hurt,” Brooks said. Having gone seven full seasons without a major injury, the Philadelphia Eagles’ right guard suffered a torn Achilles in January during the NFL Divisional Round playoff game against the New Orleans Saints. Three months later, Brooks, a Medford resident, said, if anything, the injury just added fuel to the fire. Brooks is no stranger to defying expectations. When he signed with the Eagles for $40 million in 2016, he heard rumblings of “is he worth the money?” The doubt was just motivation to Brooks, who was eager to prove his worth. When he arrived in Philadelphia, he wanted to drink in the city life and lived downtown at The Residences at Two Liberty Place. But when he saw all there was to see in Center City, he decided it was time to make a home for himself. Deterred by the never-ending traffic jams on Schuylkill Expressway, Brooks turned his gaze east and began checking out houses in South Jersey. He looked at homes in Mullica Hill and Moorestown, but with the surrounding nature and a bit more privacy between houses, it was a home in Medford that caught his eye. He made the move in February 2018. He said his neighbors have been nothing short of welcoming, even going so far as to drop off books to occupy his time after he was injured. Brooks heard rehab was going to be tough, but he’s approached the process with an unfailingly optimistic outlook. Recently liberated from his walking boot, Brooks has been anything but idle and is attacking his rehab with full force. He said he’s working out on an underwater treadmill at the Novacare Complex and will soon make his way to the AlterG anti-gravity treadmill, which uses pressurized air to take the impact off walking and running. About a month ago, Brooks started taking martial arts classes to add a bit of cardio into his routine. “As long as it doesn’t set me back or I don’t have any pain, I’ll do as much as I can,” Brooks said. He said the healing time on an Achilles’ injury can span anywhere from six to eight months, but his doctors will have a better gauge on where he’s at after his checkup in May. While the tear is his first major injury, it certainly isn’t his first setback. In 2016, Brooks opened up about his anxiety disorder. He had missed a game, played a game and then missed another game, arousing suspicions about the source of his absence. He was told he had two choices: to say he was sick and give an excuse or to tell the public the truth. He chose the latter. Brooks opened up about his struggles with anxiety, which he’s been facing since his second year playing for the Houston Texans. Crippled by stomach issues, Brooks saw doctors who went searching for ulcers and other stomach issues and repeatedly found nothing. Finally, when it was suggested that the issues might be anxiety-related, Brooks had his answers. The fear of failure had become crippling for Brooks. When he made a mistake, it consumed his mind and ate away at him. So, he began going to a therapist, who helped him come to terms with the uncertainty of the game. Since starting therapy, his anxiety issues haven’t left him sidelined. They still rear their head every game day with Brooks inevitability vomiting once that morning, but they haven’t kept him out of the game. Fellow Eagle Lane Johnson introduced Brooks to a friend who helped him to change his outlook. He suggested that Brooks view his game day sickness as part of the process his body utilizes to get ready to play. He said that’s how he sees it now, and he approaches game day morning with a lot less dread. He said some of the biggest misconceptions about anxiety are that it doesn’t exist or that it’s made up. He said while there’s still a stigma around the subject, he views mental health the same way he would a physical injury: you seek the help, do the rehab and get yourself back to where you need to be. Between being named to the Pro Bowl twice and earning a Super Bowl victory in 2018, Brooks has a lot to be proud of at the age of 29. While winning the Super Bowl was obviously a personal achievement, he didn’t fully grasp how much it meant to the city until the day of the parade. He said watching people cry – and even pour out ashes – underscored the depth of their fans’ devotion. “I don’t know if there’s a more passionate fan base in America to be honest,” Brooks said. In the off-season, Brooks frequently interns in finance. To date, he’s logged time with Kayne Anderson Capital Advisors, Susquehanna Bank and Philadelphia’s Department of Revenue – to name a few. He realized that if he was coming into money at a young age, he better learn how to manage it, so he’s made studying a priority. When his football career is through, his goal is to enter the venture capital space and invest in minority-owned and operated businesses. In the meantime, Brooks is grateful that he gets to do what he loves with a team he cherishes and in a city where the fan base is so passionate. “I thank God every day that I came here,” Brooks said.